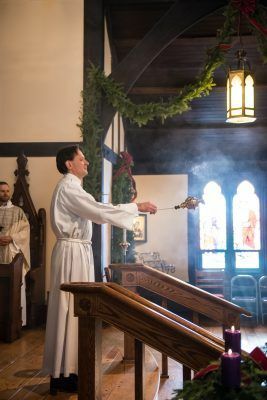 8:00 am Holy Eucharist Rite II – The 8:00 am worship is a simple, quiet service. The service begins with the Liturgy of the Word (scripture, prayers, and sermon) and ends with the Liturgy of the Table (Holy Communion). There is no music at this service, and it lasts approximately 45 minutes. 10:15 am Holy Eucharist Rite II – The 10:15 am service includes full choir and music, childcare, and Sunday School. This service usually lasts 75 minutes. Following the service there is a time of fellowship and refreshments. 5:30 pm Thursdays – A 30-minute service of chanting, silence, and quiet reflection on scripture. This service is held in the Chapel of Mary Magdalene (through office entrance on Bradley Avenue). All are welcome at any of our services, whether you are passing through, seeking a faith community, or just drawn to participating once and a while.